I knew I wouldn't be the only one totally crazy over the nail wraps I shared yesterday! They are pretty much the cutest thing ever! Thanks for the lovely comments. I seeeriously cannot wait for the trickle down to happen (because we all know it will...especially due to us bloggers). We'll be seeing cutesy nail wraps with bunnies and cute lil girls available everywhere! Ahh hurry hurry! Trickle trickle! Ok, so I've been meaning to share a little review of some recent Benefit purchases. I've been using them together for about a month. “that gal” brightening face primer, boi-ing industrial strength concealer in 2 shades (01, 02) for custom concealing, erase paste (02 medium) brightening camouflage for eyes and face, lemon aid color correcting eyelid primer, eye bright instant eye brightener, concealer brushes and a step-by-step lesson. I have to admit that I have added a few of the individual products to my shopping cart more times than I can count, only to change my mind just as I was about to check out. When I saw this kit I was just beyond psyched! ...I'll get right to it...I LOVE it! And I am sold on each and every product in the kit! I was mostly interested in trying boi-ing and erase paste...but Lemon-aid and eye bright almost stole the show...they really did what they claimed. 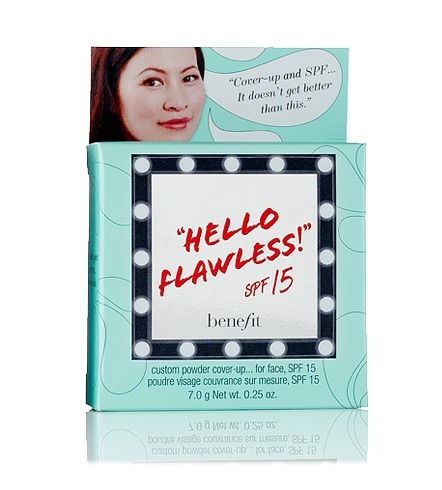 Those mad geniuses at Benefit sure know what they're up to when they make a kit collection. Just the right products paired in just the right way. I know I'll be picking up the full sizes as soon as I run out. And I was pleasantly surprised by "that gal" ! It's a silky pink primer that contains light-reflecting pigments to help brighten, with raspberry & chamomile to soothe skin. Again...this is another that I will be purchasing in the full size! Love this kit! 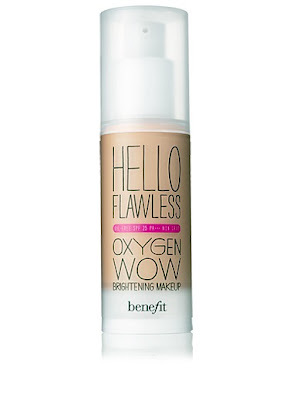 Second up is Benefit's newest foundation Hello Flawless Oxygen Wow. After a bajillion emails from Benefit, Ulta, and Sephora, boasting broad-spectrum SPF 25 protection, an oil-free formula, natural finish, hydrating benefits, and light-diffusing properties, I had to give it a try! I'm not sure it deserves the title of my "favorite" foundation, but I do love that it is weightless. It's blendable and goes on smooth. It isn't drying at all, and doesn't make me shiny. Would I buy it again? Yes! And finally... Hello Flawless powder. I wear this over the Oxygen Wow. 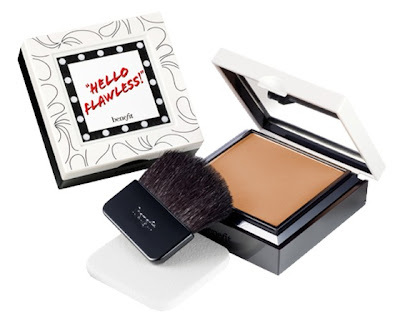 It's light and silky and totally buildable, depending on how much coverage you are looking for. It comes with a brush as well as a sponge. I just do a light dusting with a larger buki brush to set everything. I have sensitive skin that tends to be a bit dry, and this doesn't ever look cakey. I like it! This is actually my first time using an all Benefit foundation! I'm really glad I gave them a try! 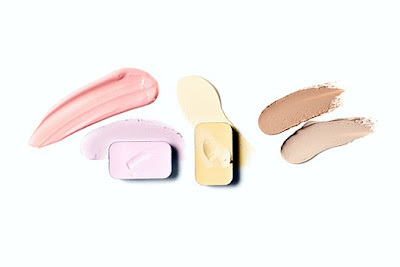 What are your fave foundations, powders and concealers? Hope you had an awesome Easter sweetie, Thanks for visiting my blog too! Anyway, I hope those nail wraps will be everywhere, just too cute not to be! :) I have never purchased any benefit products, but always been curious about them so thanks for sharing! I have combination skin and acne prone skin. I have always used liquid foundation, but started using bare minerals a few years ago and just love it, the coverage is awesome too! So I haven't really thought about switching since.